Professional pumpkin carver, Richard Spence is a big fan of Heart FM and an even bigger fan of the Spice Girls so he was over the moon to be asked to carve a special stenciled portrait on a Halloween pumpkin of Baby Spice herself, Emma Bunton who presents the breakfast show on Heart FM with Jamie Theakston. The Heart FM team travelled up by train to our creative studio in Yorkshire in October to spend all day recording a time lapse film of the pumpkin carving for their Halloween celebrations on social media. We are close to both Mytholmroyd and Hebden Bridge train stations and have the facilities at our studio to set up backgrounds and lights for professional, press and promotional photography and filming, we also have plenty of tea and coffee and local cafes to keep everybody going throughout a shoot. 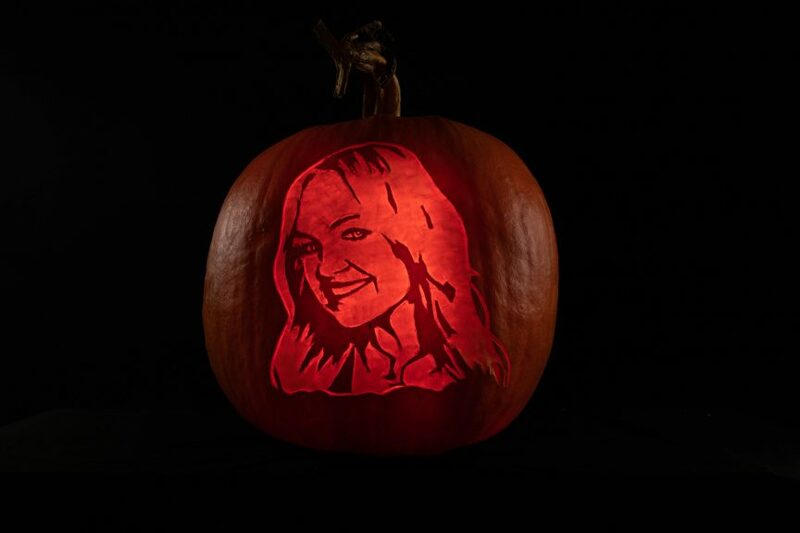 Rich carved the pumpkin with a superbly detailed portrait of Emma Bunton’s stencilled face and the Heart FM logo on the back. The finished Halloween pumpkins glowed beautifully when he finished late in the evening. As well as the time lapse film, Rich found time to record some top tips on advanced pumpkin carving for all his fellow Heart FM fans so they can do their own Halloween pumpkin carving. We wonder if Emma Bunton likes a nice cup of tea as much as Rich does?